In the age of social media, internet trends like ‘Sonam Gupta Bewafa Hai’ and Demonetization news have found their way in the IIT Exam Papers. Read more about it here. Internet sensation and popular meme ‘Sonam Gupta Bewafa Hai’ which went viral after the Demonetization of Rs 500 and Rs 1000 notes; has impacted all of us. However, students from IIT-Guwahati would have never imagined that the Bewafa Sonam Gupta will impact their exam grades by making her way into the IIT Exam Papers. 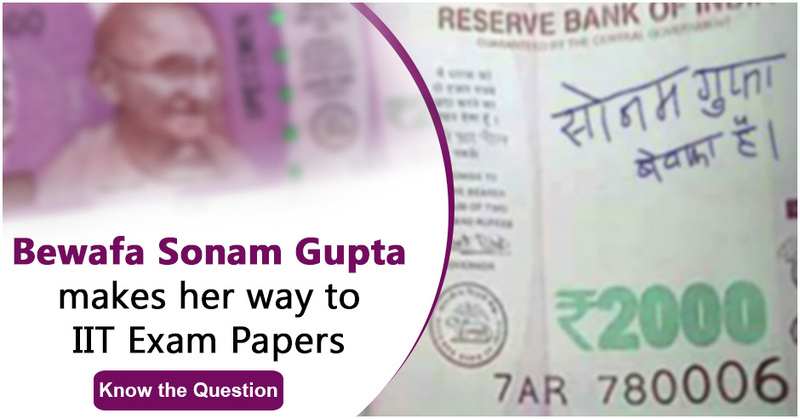 No matter how bizarre it sounds, a professor from IIT-Guwahati included the popular Internet meme of 'Sonam Gupta bewafa hai' in the probability question paper. Adding a dash of humour to the otherwise technical paper, the professor managed to not only surprise the students but also drew some chuckles from them in the examination hall. The probability question which was asked by the professor was: What is the probability of Sonam Gupta being bewafa if a person ‘X’ is bewafa as per dependency structure; keeping the following binary variables in mind. Simply put, IITians had to use the provided information to create a draw a Bayesian network and convert it into a factor graph. Just like the ‘Sonam Gupta Bewafa Hai’ meme on currency notes went viral; the IIT Guwahati Exam paper which was shared by a student also went viral on the social media garnering thousands of likes and shares. Despite being a bolt out of blue, IIT students were happy that the professor had attempting to do something out of the box to add humour, surprise and innovative use of current internet trends in the IIT Exam paper. In another similar instance, Prof Ravinder Kaur, head of humanities and social sciences department at IIT-Delhi, attempted to do something similar while setting the sociology question paper. Taking inspiration from the Demonetization of Rs 500 and Rs 1000 notes, the professor included a question in which students had to evaluate the effects of demonetization of high currency notes on the suicide rates in the country. Based upon the Durkheim's (French philosopher) suicide theory, it was a compulsory 10-mark question that threw even brightest of engineering minds from IIT off their game. Commenting upon the decision to include a topic of common discussion in the IIT exam paper, Prof Kaur said, "In social sciences (and humanities), we often try to illustrate and explicate theoretical concepts and ideas by relating them with contemporary events and happenings. Students engage more with what we are teaching when they realise it has some usefulness for understanding what is happening around them. Also, such questions make students learn how to think logically and creatively and not simply reproduce what has been taught in class or given in a book or a theory." According to her, a similar approach can help engineering students to apply the technical knowledge they acquire during their academic year in practical situations. She also quoted examples of Narmada Dam on which questions can be framed for civil engineering students whereas smog and pollution can be a topic of discussion for atmospheric sciences students and others. In today’s age of social media and viral news, this out-of-the-box initiative by IIT Professors is a commendable step. It will help students to co-relate the generally dry and technical topics of their syllabus or studies with the recent happenings and current trends on news and social media.